The Ford Focus ST255 is well known for having a poor intercooler system ,as fitted by the Ford Factory. With the very strong 5 cylinder Volvo engine been capable of well over the factory 225 bhp we think that with the summer months approaching its an ideal time to give your pride and joy the Pumaspeed Power treatment. 1 x RoadSport ST 225 Intercooler (any colour choice) for fully fitted intercooler cost see the fitting tab below. A perfect solution for any standard spec Focus ST 225 or even a heavily moddified car with no intercooler or remap. Gain big power and lower charge temperatures in one swift purchase. Stage 3+ Ultimate 322 - Aggresive remap specifically for the full Bolt on list for Standard Turbos and Hybrid 340-350RS units. The Strategy device has the usual 5 mappings, the Ultimate handset has 2. All Pumaspeed's expertly configured maps are to be fitted to the car at the PumaSpeed Performance Workshop. We will give you the best Map available for your car but unfortunately not a tuning box to keep. Alternatively if you wish to purchase your own SCT Tuning box , MAXD OUT PROGRAMMER or Bluefin programmer see the drop down menu next to the 'add to cart' icon. The Pumaspeed Workshop team are ready to fit the Focus ST 225 Intercooler and Remap Power Package in our Head Office located here. We estimate the labour time to be approximately 0.70 hour(s) costing £54.60 inc VAT. Therefore making parts and labour a total cost £504.60 (inc. VAT). 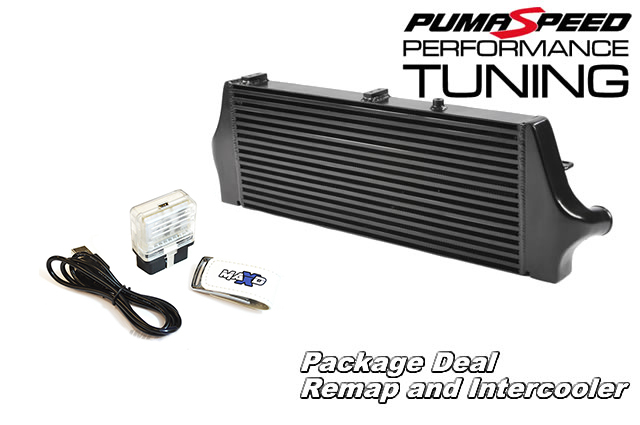 Pumaspeed have a specialist distribution team that can dispatch the Focus ST 225 Intercooler and Remap Power Package to any destination worldwide.